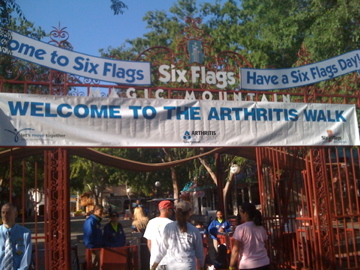 The Arthritis Walk at Six Flags Magic Mountain was a smashing success today! There was a HUGE turnout and the theme park was the perfect location. Having the walk at an amusement park really made everything more festive. We did a short walk around the park, while a custom playlist of “walking” songs played: Walkin’ on Sunshine, Walk Like an Egyptian, I’m Gonna Be (500 Miles), and more. I love that it was a short walk. It’s not about the 3 mile (or 1 mile) walk, it’s about the people and the money and awareness raised. The short walk gave us more time for bonding with other arthritis warriors and supporters. My two supporters were my beau PJ and my good friend Holly. PJ was the tattoo artist at the Arthritis Foundation booth and hooked kids and adults up with a “Kids Get Arthritis, Too” tats. Holly has been to nearly every Arthritis Walk since I starting going to the walks back in 2001. The walk is an early call for a Sunday (9am), so yay to PJ and Holly for coming out! Those that raised $150 dollars or more were given a free ticket to get into the park for the rest of the day. Sweet! A group of six of us (thanks for the coaxing, Jocelyn!) went into the park after devouring burgers and hot dogs from the walk BBQ. We rode a few rides, got a little sunburned, and then called it a day. It was great seeing people in the park with their Arthritis Walk shirts and Hero hats on as we wandered around the park. I’m looking forward to the Irvine Walk in two weeks that I’ll be doing with my brother and mom. If you haven’t done so already, sign up for an Arthritis Walk near you and raise money for a cure and awareness for this often invisible disease. Today, President Obama will sign the American Recovery and Reinvestment Act (H.R. 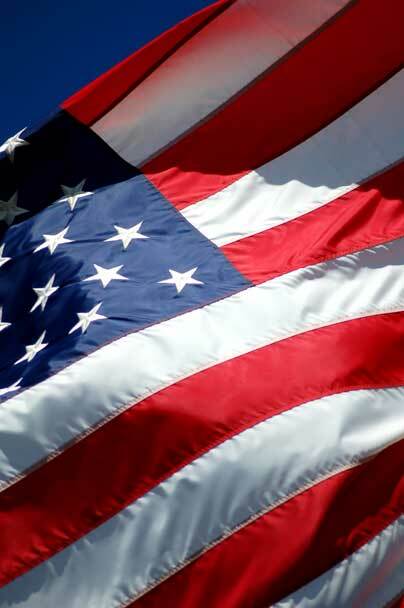 1), a $787 billion economic stimulus bill as passed by Congress late last week. The stimulus bill includes $650 million for a Prevention and Wellness Fund that will provide for evidence-based clinical and community-based prevention programs (mainly funded through the CDC) and $10 billion for research at the National Institutes of Health (approximately $140 million for the National Institute of Arthritis, Musculoskeletal and Skin Diseases). Thanks to your advocacy efforts and that of the Arthritis Foundation, research and public health provisions with the aim to target more resources to arthritis research and prevention have been included in the final bill. The details of the legislation, as well as the rules and regulations governing the specifics still need to be determined. However, the bill calls for investing in evidence-backed, community-based disease prevention programs and includes accountability measures to ensure the funding is being used to directly improve the health of Americans. The Arthritis Foundation will be advocating to the new Obama Administration that 1) Arthritis research needs to benefit from this stimulus funding and 2) Arthritis Foundation programs are evidence and community based prevention programs that need to be supported throughout the nation. Stay tuned as more details of this massive legislation emerge! I am writing to ask you to please take some time between now and the end of the day (January 31st) to vote for me in Wellsphere.com’s Health Blogger Awards. I don’t expect to win, but I would love to make it into the top 100 list that they will be publishing. This will help me work towards my goal of reaching as many people as possible with arthritis and offering you a place to vent, while also providing you with gathering tools for coping. If you are not a member of Wellsphere, they will ask you to register on their site in order to vote. It is a bit of a hassle, but it shouldn’t take more than a few minutes. And the time you take to vote for me will be much appreciated. 🙂 Thank you to all who take the time to vote for this site. And thank you to all who have become loyal readers and inspired me to keep searching for interesting stories to blog about. Do You SureClick? Should I SureClick? 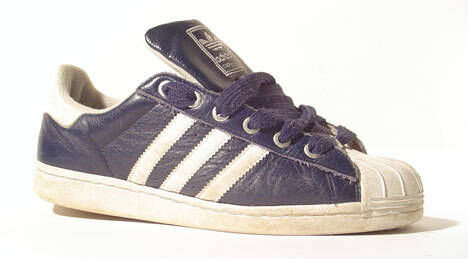 Grab your sneakers! It's time to sign up for the Arthritis Walk. I love the arthritis walks for two simple reasons. The walks raise money for the Arthritis Foundation and awareness for arthritis-related diseases — two very important things. It’s time to start building teams and raising money for your city’s arthritis walk! Start early and stay dedicated to your cause. Your local Arthritis Foundation branch will appreciate your efforts! Local Plug: If you live in Los Angeles, like me, there is a good possibility that you could hit two walks. There will be one on May 3 at Magic Mountain and one on June 7 in Santa Monica Beach. If you live in LA, join our Facebook Group for the Magic Mountain walk in Valencia, CA. Start a team and we’ll see you at the theme park on May 3! So … what are you waiting for. Here’s your chance to get involved and make an impact! Find a walk in your area by going to letsmovetogether.org. Start a team and invite your friends to join you. Over the course of the next few months, I’ll be offering fundraising tips and ideas, so check back often. If you have tips of your own to offer, leave them in the comments or email me. Shameless Plug: Buy one of our fun, ArthritisFriend.com tees and wear it proudly at your local walk! The 111th Congress began on January 6, 2009, and all legislation not signed into law before that date must be introduced again. The Arthritis Foundation is very pleased to announce that Representatives Anna Eshoo of California and Fred Upton of Michigan plan to introduce the Arthritis Prevention, Control and Cure Act in the coming weeks. They will introduce the same legislation that unanimously passed the House of Representatives in September 2008. Since it is a new Congress, there will be a new bill number once it is introduced. Before it is even introduced on the House floor, YOUR Representative has an opportunity to indicate their support of this critical legislation by joining Reps. Eshoo and Upton as an original cosponsor. 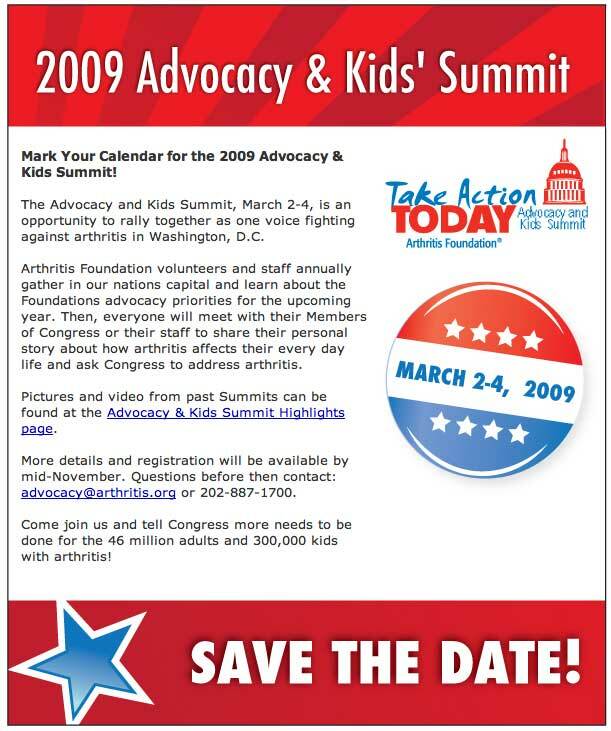 Please contact your House of Representative member and ask him/her to be an original cosponsor of the Arthritis Prevention, Control and Cure Act of 2009. Find out how you can take action, by clicking here. I think we’d all like the world to become a more arthritis-friendly place. To that end, I came up with a list of nine things that could set that idea in motion this year. Our own reserved parking spot in front of our Rheumatologist’s office. Prizes hidden in prescription pill bottles. If Cracker Jack could do it with popcorn, why can’t Pfizer do it with Celebrex? Seats on rides at theme parks should have more cushion. Most notably, the Matterhorn at Disneyland. A rewards program for Enbrel patients. Buy 11 months of Enbrel, get one month free. After all, at $350(ish) a month on COBRA, the makers of Enbrel are doing better than most drug lords in Columbia. To be able to earn points for each prescription ordered through the local pharmacy — points that could be used to purchase an Amgen beach towel or an Arthritis Foundation wind breaker. I’d like better food at the Dining Hall at Camp Esperanza , a camp in Big Bear, CA for kids who have arthritis. Plus, I’d like to witness better pranks. Shaving cream is so five years ago and I know the kids can be cleverer. I know all women agree with this, but especially those of you with arthritis — I want more women’s shoes that look cute, are uber-comfy and not frumpy. Okay, now it is your turn. Add your wish list via the comments! Here’s to a happy and healthy new year for all! I wimped out. Here I thought I was finally feeling comfortable enough in my arthritis skin that I could discuss it with almost anybody, but when I stared straight into the face of a perfect opportunity to "share my story." I totally wimped out. Note: It’s been a few weeks since this incident and since I began writing this post, and I have mellowed out and am not "beating myself up" so much for my perceived failure. Here are the details of that day a few weeks ago: I was at lunch with three coworkers. One is aware that I have arthritis, but doesn’t really know the particulars beyond that. The four of us began discussing allergy shots, which led to a quick rant on how giving yourself or someone else a shot is icky and inconceivable. I agreed that it is icky, but I also wanted to share with them that when someone is given the option to feel better and it involves giving themselves a shot, you’d be surprised how quickly the squeamish muster the strength to pull the trigger and release the hounds. I am the poster child for this. I talked myself out of sharing with them that I have arthritis about 10 times in a matter of a minute. I think the reason for this partially hinged on my mental state that day. I wasn’t feeling particularly confident. I was also worried about their reaction to this information — would they ultimately understand why I was sharing this information with them? Maybe they would wonder why someone who looks physically normal would have to give themselves a shot twice a week? I hate feeling misunderstood. Would they feel sorry for me? I don’t want them to. Arthritis is just part of who I am. < Loud sigh > Sharing your story and information about your disease is always complicated. Determining the appropriate amount of information to divulge is a challenge. Once you decide to open up about arthritis, then you have to decide how much to tell. I personally don’t want to overwhelm people with information about a disease they really can’t see. Often, no matter how much information we offer, people just don’t "get it" the way we wish they did. Despite that, I believe there are a number of good reasons to make my battle with arthritis public knowledge. It allows people to get to know me better. It propels me to continually strive towards full acceptance of my disease. Discussing my chronic condition will raise awareness about this disease, especially the fact that it affects young adults and children. Maybe that awareness will eventually translate into research dollars or more compassion towards arthritis patients. We know that when most people think of arthritis, they think of older people with crooked fingers. They don’t know about the fatigue or the chronic pain or all the maintenance medications that I happily consume even though one of them might saddle me with lymphoma some day. For a long time, only a few of my close friends and some family members knew that I had arthritis. Back when I was diagnosed with arthritis I was a very private person. I wanted to control very carefully what people knew about me. On top of that, I had no idea what this disease meant to me personally. As I write this post, I realize that I have a lot to be proud of. I am finding my niche in the world as a person living with arthritis. And the bottom line is that I am the most comfortable and confident as I have ever been as a young woman with Rheumatoid Arthritis. It will always be a struggle to determine who to let in to my arthritis world and how much to tell them. The fact is, no one is truly going to understand the way we wish they would unless they are going through it themselves. In order to cope we need to be connected to people who understand life with a chronic disease. Arthritis warriors "get it" and that’s why we must stick together. Thanks to all of my arthritis friends out there for their support and insight! You guys are the best. As the 110th Congress winds down, we wanted to provide an update on the status of the Arthritis Prevention, Control and Cure Act (H.R. 1283). There was no Senate consideration of the bill during the November “lame duck” session. It is possible that Congress will meet again in December given the current economic conditions, so we will continue working to find any opportunity to make headway. At the same time, we are beginning to look ahead to the New Year with a new Congress and a new Administration. Your past efforts at reaching out to your Members of Congress have not gone unnoticed as evidenced by the unanimous House passage of the Arthritis Act in late September. The Arthritis Foundation will be calling upon all its advocates again to continue the momentum and push the Act through both the House and Senate next year. Resolve to get involved! Click here to find out how to become an advocate. Resolve to get involved next year!! The links above are not “hot.” Check out last year’s highlights here. Has anyone attended this event? I would love to read your experiences in the comments. I’m thinking about going to Washington, D.C. this year to let my voice be heard. Earlier this week, we sent the attached letter to now President-Elect Barack Obama. The Arthritis Foundation will be working with the new Administration, and with the new Congress, on policies and legislation that will expand access to comprehensive health care to include preventive care, self-management programs, surgical interventions, rehabilitation services, and prescription medications for people with arthritis. We must work together, and with other like-minded organizations, at improving the care for people with arthritis. It truly was a watershed moment for people with arthritis to be featured on national television by a candidate running for our nation’s highest office. We plan on using this opportunity with President-Elect Obama and his new Administration to engage in substantive policy and advocacy work on behalf of the 46 million people, including nearly 300,000 children with arthritis. Do you think it will be possible to find a cure for arthritis in my lifetime? My answer: Yes we can!